Entrance to de Ridderzaal from inside Binnenhof. Ridderzaal translates to the Hall of Knights or lit. knight’s hall, with ‘zaal’ meaning hall, or also in some cases a large room like e.g. an auditorium, and ‘ridder’ being the Dutch word for knight. It looks like a gothic church. The Dutch word for a church is ‘kerk’. Sky in Dutch is lucht (sorry, there’s that ‘g’ sound again, which is also written as ‘ch’). After a painful battle with influenza, I emerged victorious from my bed for the first time in a week to vote yesterday. Whilst I get the impression that people have come to accept my complaining about being fatigued, or hugely behind on coursework, as part and parcel of what it’s like to converse with me, it’s my Dutch nationality that really surprises. On the one hand, I recognise that I have a definite preference for speaking English. I’m very shy when it comes to opening up to people through Dutch. Whilst I feel perfectly comfortable using Dutch in everyday situations, such as thanking the bus driver or buying groceries, I get incredibly insecure about my Dutch in more intimate social settings. In such situations, it sometimes feels like I am unable to express my truest self, as what I would say in English doesn’t always translate smoothly into Dutch. I then need to express myself differently to get the same point across, and this slight divergence in vocabulary choice or use of mannerisms doesn’t always come as naturally. I suppose this is where language and behaviour, extendable perhaps to cultural preferences, intersect. It requires practice and exposure, and in my case, also some courage, to translate intended meaning from one language to the next. All-in-all, I sometimes struggle with nuance, despite having been raised bilingually, and knowing the ins and outs of Dutch culture quite well. One of the entrances to Binnenhof. Binnenhof itself translates to internal or inner courtyard, but the name is used to refer to the entire complex generally. Entrance in Dutch is ‘ingang’, which translates to ‘in + hallway/ passage way’. Seeing there are many in this picture, the Dutch word for window is ‘raam’ (like ramen noodles, yasss?). On the other hand, being able to speak Dutch fluently and you know, being Dutch, I sometimes get frustrated when I do speak Dutch to people and they reply in English anyway. Although I recognise that people are trying to be accommodating, important to note here is that my accent isn’t necessarily odd or dare I say ‘foreign’. I think, it really comes down to slightly archaic word choices at times. Furthermore, having lived here for 6 years now, it still perplexes me that people address me in English purely based on looking at me. I think this partially comes down to dress sense and partially to body language. That said, until about a year ago, it only contributed to my aforementioned insecurity regarding Dutch, and up until today, I still can’t quite pinpoint why I’m not considered Dutch upon first glance. Having accepted that this is just a downside to being raised within a multicultural environment for myself, I can imagine that living in the Netherlands, and actually feeling fully at home here without speaking Dutch, can be quite difficult. Lange Voorhout, in my opinion, is most beautiful during springtime (that’s now, so go there), when it’s covered in these purple (paars) and white (wit) flowers – if you want to describe the colour of the flower, you would say: paarse / witte bloem. The Dutch word for spring is ‘lente’. The word spring itself is the verb for to jump in Dutch. The word for flower in Dutch is ‘bloem’, and these crocuses in particular are called crocus (sg.) and crocusen (pl.). Tree is boom (that’s a long ‘o’, so not like the English foot but like post.). Bicycle, as you probably already know, is ‘fiets’ (with ‘ie’ being pronounced like the ‘ee’ in feet in English). Man in Dutch is also written man but pronounced m-ah-n.
Having read a number of articles on The Leidener about why learning Dutch gives you an advantage (just to confirm, it absolutely does), I thought it would be much more exciting to teach you some Dutch vocabulary whilst simultaneously showing you around The Hague. You’ll find new vocabulary in the description under each picture used in this blog post. At the very end of this post, you’ll find a summary of the vocabulary as a word list, with the Dutch words first, followed by the English translation. Ultimately, I hope that by teaching some context-based vocabulary to you, that you too might overcome any insecurities you might be experiencing in regard to speaking the Dutch language or living in the Netherlands. Happy learning! Noordeinde: Now that spring’s here, the Dutch cultural custom of “terrasje pakken” will increasingly become apparent as the weather continues to improve. It literally means grabbing (pakken) a terrace (terras), with the -je at the end of words marking a diminutive form of a noun. The Dutch for lights in the case of the string of lights featured being ‘lichtjes’, or if the ‘g’/ ‘ch’ sound is too difficult at the moment, ‘lampjes’ is fine whilst you’re learning. 10. Binnenhof – inner courtyard. 25. Lichtjes/ lampjes – lights*/ lamps* (examples showing string of lights). ** let me know in the comments if you want me to explain verb forms in Dutch in a future blog post. 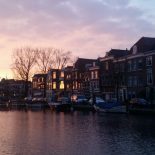 This entry was posted on March 17, 2017 by Sarah-Louise@TheLeidener in Culture, Living in Holland, Uncategorized.